As you may know I have been donating my Expressed Breast Milk (EBM) to someone who needed it.. Why would I want to donate it? It is really like my fresh and bone.. it's all my hard works in establishing and pumping it out.. as this is the reason too I want to share it with others who needed and appreciated it so I can help others needy people on this... don't wish my liquid gold to go on waste or vein if is unconsumed in time.. but i would actually clarify much on the recipients before i decide to donate my milk to.. reason is simple I don't wish my milk to be wasted!!! so far i have donated the following milks..
2. 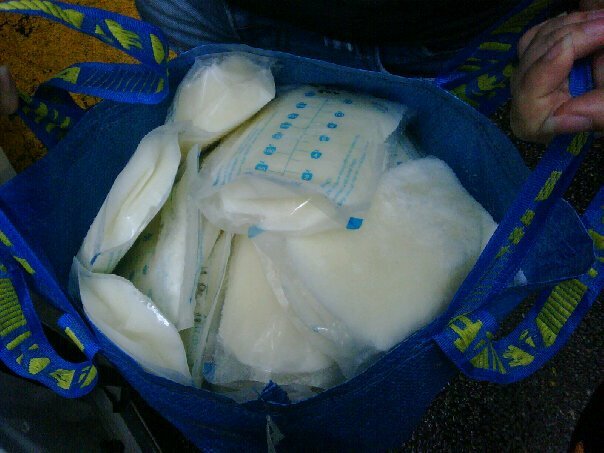 25 bags of 9oz milk to a 3 year olds little girl who is disable and doctor said only EBM can help her..
3. below also is donated to the 3 year old little girl..
4. 2 bottle 5oz milk donated to my cousin newborn while waiting her own breast milk to establish.. I am proud of her as she is now also a fully breastfeeding mother!!! so, as conclusion if you are blessed with so much milk and please share your happiness with others too!! good job! Well done! I am very proud of u! I have EBM too. Finding a hard time to find someone who would take my EBM. Any advice?